The statistic illustrates the Amazon Web Services cloud computing and hosting revenue as of the fourth quarter of 2018. 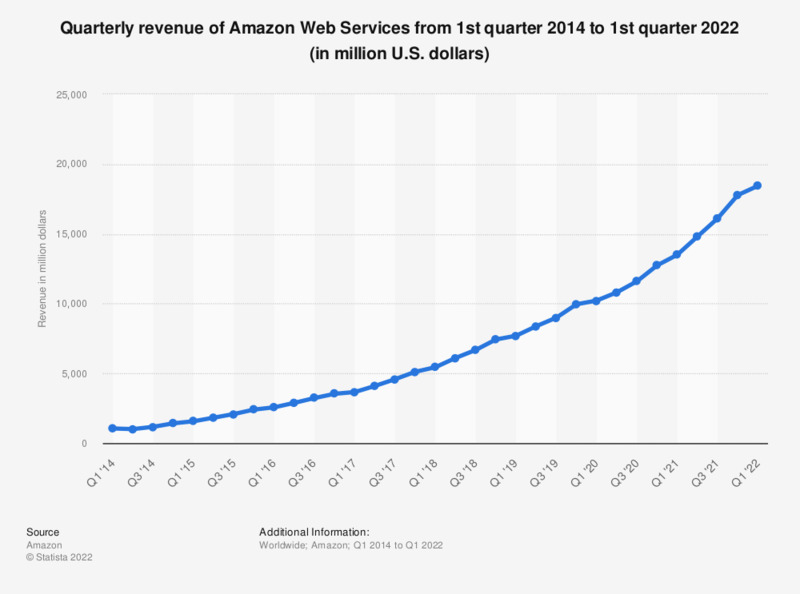 The last reported quarter, AWS generated revenues of 7.4 billion U.S. dollars. Amazon is the one of the leading online retailers worldwide and the leading e-retailer in the United States. In 2018, net sales amounted to over 232 billion U.S. dollars, up from 177 billion U.S. dollars in the previous year. Amazon is the world’s largest online retailer of books, clothing, electronics, music and many other consumer products. The company is also the producer of the world’s most famous e-book reader, the Amazon Kindle. The vast majority of Amazon’s revenues are generated through the sales of electronics and other products, followed by third-party seller services and AWS. Although primarily active in the B2C market, Amazon also enables third-party sellers to trade their products as well as providing technology infrastructure services (Amazon Web Services, AWS) to businesses. As of the third quarter of 2018, 53 percent of paid units were sold by third-party sellers. Amazon Web Services include cloud computing and hosting services which is a growing sector of online enterprise services. AWS is one of the most popular public cloud platform and infrastructure service worldwide, with 64 percent of respondents from a global survey indicating that they were already running apps on the platform. Other popular cloud services providers include Microsoft with Azure, Google, Oracle and IBM.